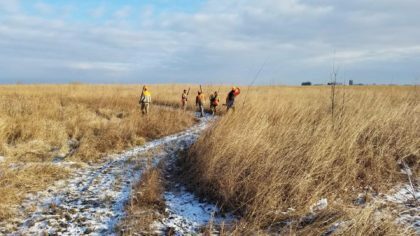 This past Veteran’s Day, Christensen Farms & Feedlots, Inc. (CF) was proud to support the Hunting with Heroes program, a non-profit organization focused on the physical and emotional healing of our nation’s military heroes through community support, camaraderie and hunting in the rural communities of Iowa. Each year, during the weekend of Veteran’s Day, veterans are flown into Iowa from all over the country to attend Hunting with Heroes. 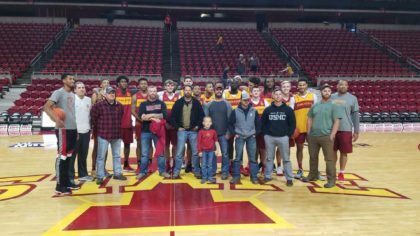 This year, the seven veterans in the program participated in trap shooting events, a meet and greet with Iowa State basketball and volleyball teams, and a duck and goose hunt. They also spent a portion of the weekend hunting pheasants on donated land and at a Veteran’s Appreciation Banquet. 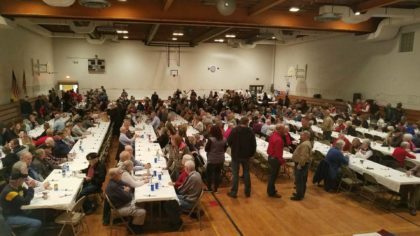 The Appreciation Banquet was a big hit this year with over 600 people in attendance, including area veterans and community members. At the banquet, each veteran in this year’s Hunting with Heroes program was showcased and was able to talk about what the program meant to them. CF Service Manager Nich Holland, who has been involved in the organization the past few years, plays an integral role in the success of this weekend every year on behalf of CF. This year, Nich was able to share a bit more about CF with the group, which included serving some Daily’s bacon (a part of CF’s integrated/connected system) during breakfast their last day. CF also recognizes all the Hunting with Heroes leaders for their dedication to appreciating veterans who serve and protect our country.